In partnership with StreetARToronto, we commissioned artists Philip Cote and Jim Thierry Bravo to collaborate on a mural for Roncesvalles Village. In the cool hours of the day, you’ll find them painting the wall on the north east side of Roncesvalles and Garden Ave. They will work through July until finished. The official launch will be on October 20, 2018. Meanwhile, you can enjoy the work in progress. In the twilight, Philip Cote adds finishing touches on the bear at 149 Roncesvalles Avenue. Cote and Bravo’s design concept reflects the thematic framework set out by the RVBIA’s StreetArt Advisory Committee. These themes include: Nature in the City, the Urban Community, and the interconnected concepts of Legacy, Sustainability and Stewardship. Their collaboration also draws on some of the insights gleaned from several community consultations. These affirmed that the people of Roncesvalles love being so close to High Park and Lake Ontario. They cherish all the trees and the gardens that make this a healthy and lovely place to live. Locals and visitors alike appreciate the sense of community, the village vibe, and tender loving care you can feel here. Cote and Bravo bring together the sensibilities of a First Nations artist with those of a first generation Canadian artist. Bravo’s family immigrated to Canada in 1985 and settled in Toronto when he was young. Both have lived on Roncesvalles Avenue and are well known mural artists in this City. They have witnessed how the neighbourhood has changed in the past 30 years. 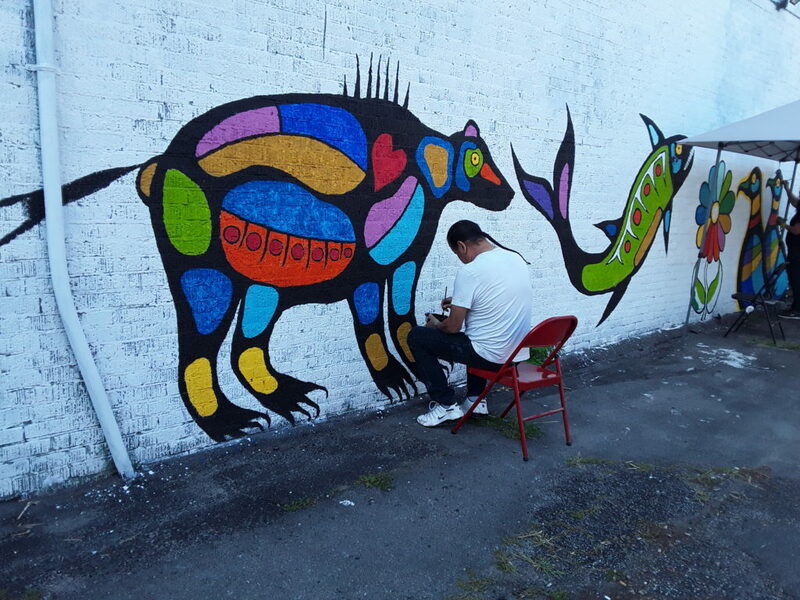 The BIA will provide online video and audio clips of the work in progress and hopes to share some of the stories and meaning behind the symbols on this mural. On the design of this mural we have first man and woman taking that first journey across the land and in communion with all life as displayed here by the animals, plants and the Anishinaabe Spirit World. We have stories of prophets who came to the people a millennium ago to give visions of the future that would come in stages called the Seven Fires. In recent times there has been talk of an Eighth Fire in which the ancestor prophets say that to light the Eighth Fire Indigenous People will come forward with their knowledge connecting with the western knowledge and from this union a new people will emerge, lighting the Eighth and final Fire. This will begin the golden age of peace. I have been given a great and honorable artistic challenge. Artistic collaborations are a delicate dance of two visions. My vision for this design comes, I hope, as a sensitive and complimentary response to Mr. Cote’s narrative on the First and Founding Peoples of this region of our City/Province, etc. Through an interplay of bold, highly stylized and graphic illustration (as a method through which to correspond with Cote’s Woodlands approach) I have chosen to present a take on what I feel are the three founding attributes of what is at present known as Ward 14/Parkdale-High Park. These three attributes are the waterfront, the long-standing local architecture which has witnessed the coming and going of many different settlers, and the wide natural array of trees, flowers and plant life. The arrangement of the word “Roncesvalles” is designed to invoke a feeling of movement, change, development, space and inclusion, but ultimately that something is about to eventually settle down – only to be carried off again through progress, symbolized by the land rising out of the water. I have decorated the word with flowers and plants found in the area and it is these swooping components that propel the word — and thus the community — into the present day. On close inspection various “umbilical” lines stemming to and from the text are placed as connection portals to Mr. Cote’s surrounding narrative. Version 2 includes an aqua background and ochre sky. This design concept by Philip Cote and Jim Thierry Bravo is close to final. There are a few more changes to come including to the lettering of “RONCESVALLES” and the plants and foliage that are intertwined; removal of the blue waves above the moose and buffalo; addition of a forested landmass rising on the right side and some additional details. The final changes will be made directly on the mural. There are seven windows and two doors in the wall to work around. The pharmacy window on the left painted by a previous artist will be retained at the request of the business owners. This entry was posted in Beautification, Community News, CURRENT on July 23, 2018 by Veronica Feihl, Executive Director, RVBIA.